This is all Cristi’s fault. She posted a third version of her lovely crocheted market bag, I said that I wanted to make one but was suffering from an all wool stash, when the pattern calls for cotton. 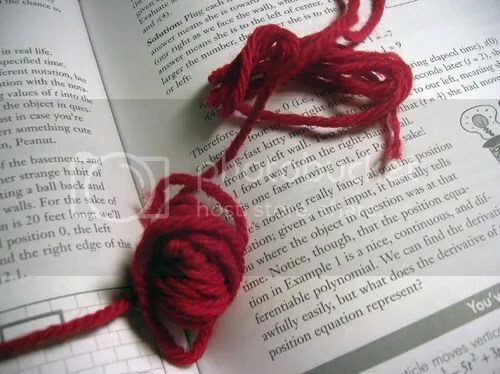 So she says, why not just make one in wool then? And it’ll be a perfect gift to my mum so she can haul her library books around. 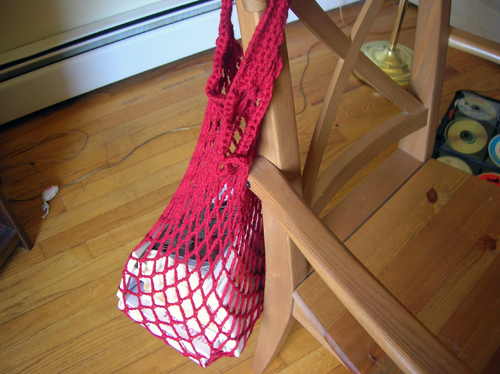 Pattern: Cristi’s crochet market bag. I’m too lazy to find a link—check Ravelry or her blog linked above. Yarn: Cascade 220, one skein. Hook: 6mm/J, which is still the only crochet hook I own. I should amend that. Rav page over this way. The cats are SO unimpressed with my crochet skillz, although they both gave the bag a good sniffing/scent marking. 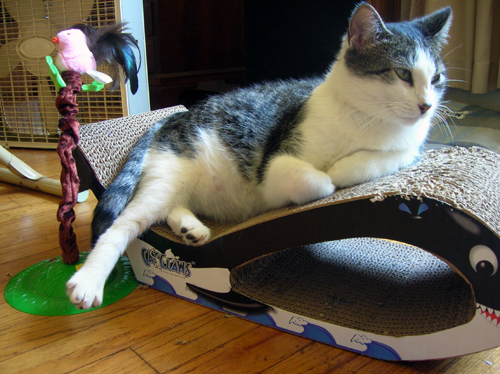 Kitty is currently too busy pretending that she’s in a tropical paradise to care about anything, though. Way, way back when I first started knitting, I also tried a bit of crocheting, since at that point I wasn’t too clear on the difference between the two. Turns out the difference was that knitting clicked for me, and crocheting did not. So I put down the hook and picked up the needles and all was well. Except I had to look up some crochet instructions the other day (for purposes that will remain secret until later in the week) and all of a sudden got the urge. 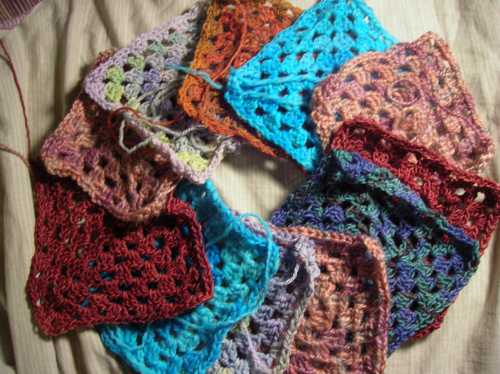 The urge for granny squares. I meant to post about said squares early yesterday; problem is, they go so quickly that I took a picture of the first one, and before I could even get it uploaded, I had four more. So I took a picture of those, but before I could get this post written, another two had shown up. And then another. And now I have ten eleven. Of course, by my reckoning, I’ll need 100 6″x6″ squares if I want a 5’x5′ blanket. So… I’d better get to it. And I’d better scrounge up some more sock yarn scraps.